How to setup DNS Over TLS in Android P and use Cloudflare's 1.1.1.1 DNS? How to setup DNS Over TLS in Android P and use Cloudflare’s 1.1.1.1 DNS? Leave a Comment on How to setup DNS Over TLS in Android P and use Cloudflare’s 1.1.1.1 DNS? Google just announced Android P Beta 2 today for Pixel series and 7 more manufacturer smartphones. The developer preview images are readily available download and the OTA is also rolling out right now. Android 9.0 P comes with many new features such as Adaptive Battery, Adaptive Brightness, App Actions, Assistant voices, new Google News feed, and much more. The most stunning feature is the Private DNS over TLS support. Now, you can use your own private DNS by default. So let’s see how to setup a private DNS on Android P.
What are the uses of using DNS over TLS you say? Changing DNS can significantly boost the internet speed of you Android devices, WiFi routers, Windows and Linux machines. Some DNS may also be useful in unblocking blocked or throttled websites. Most importantly, a good DNS is more secure as it adds an additional layer of security and privacy. Also, in most cases, your ISP cannot track your usage, and the websites you visit. Recently, Cloudflare released its 1.1.1.1 DNS support for all your devices. Cloudflare claims that the DNS they provide is more secure, and faster than any other DNS available out there including the popular ones such as Google DNS 8.8.8.8 and the OpenDNS. So now that we have Android P Beta 2 released for a lot of Android devices, you can test and setup Cloudflare’s DNS on your devices. You can use other DNS as well. Here is the full list of many DNS providers. The list consists of Quad9’s 9.9.9.9, Surfnet, Cloudflare’s 1.1.1.1, UncensoredDNS, and much more. List of available Hostnames that can be used for DNS over TLS in Android P.
authentication column. Let’s see an example on how to use Android P’s DNS over TLS support. 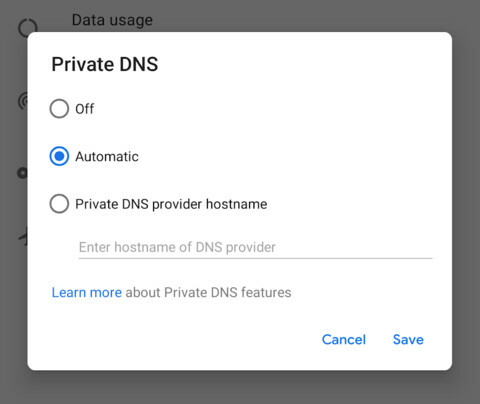 How to setup Cloudflare’s 1.1.1.1 with Private DNS over TLS feature in Android P? Now that Android P supports DNS over TLS you may want to setup the Cloudflare’s new 1.1.1.1 DNS service. There are other ways to setup too. Howeevr, that requires a rooted device and a Magisk Module as well. The list above consists of a lot of DNS. However, for Cloudflare’s DNS to work, the string listed does not work. So here is the correct Hostname for the same. First, make sure you have Android P enabled device. Open Network & internet settings > Private DNS. Or simply search Private DNS from settings search bar. Also, for users who would like to use Quad9 DNS, can use dns.quad9.net only, as the Hostname resolves to 9.9.9.9. Note: For a complete secure network, you can also setup DNS over WiFi router. See instructions below. How to setup setup Cloudflare’s DNS with WiFi router? Connect to your WiFi router. Input the username and password to log into your router. This information may be labeled on the router itself. In your router’s configuration page, locate the DNS server settings. Usually under Network > Advanced. Note down any existing DNS server entries for future reference. Save your settings, then restart your browser and router as well. Now visit our website and see how fast it is. Alternatively, you can go to this page for more device setup.